Source: Traditional; published in English Dance & Song, January February 1940, Volume IV, Number 3. 32 bar jig. 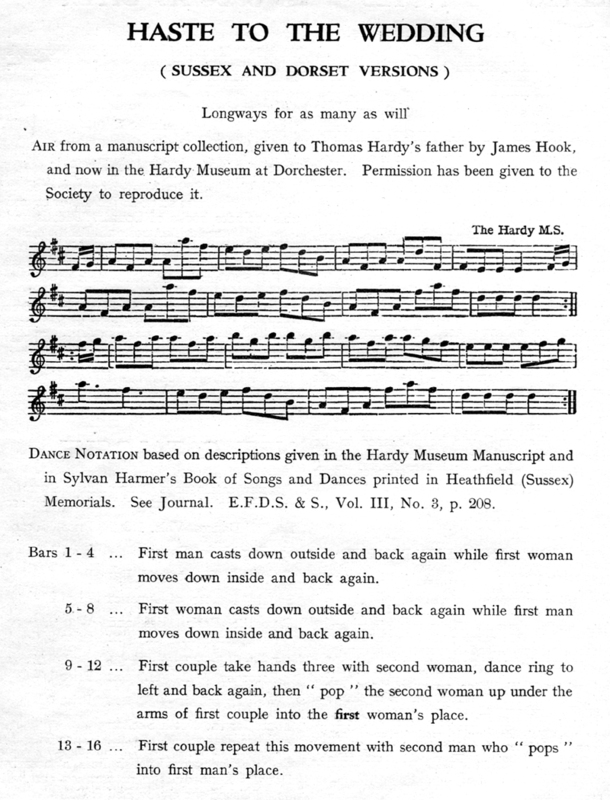 It has its own tune, "Haste to the Wedding", in which bar 5 of the B music is just two dotted crochets (quarter notes); this punctuation is used to effect in certain versions of the dance. The first known appearance of the tune was in a stage show "The Elopement", produced in London in 1767. The tune is known under countless names including " Cut Your Toenails You're Tearing All The Sheets"! This version of the dance is from Sussex and Dorset. The Community Dance Manual has this version and also a completely different dance with the same name in a Sicilian Circle, which used bar 5 for two claps. Thomas Hardy's Dorset version uses bar 5 for the "pop", followed by reversing the direction of the circle. The circle & "pop" move is also a popular Appalachian move known as "Shoot the Owl". "Haste to the Wedding" is a very popular tune and countless other dances have been written to it. There are Irish and Scottish dances, and lots more historical ones documented at Dance History Alive!.